Is Gigabyte’s Waterforce the ultimate supercool and whisper-quiet GTX 980? 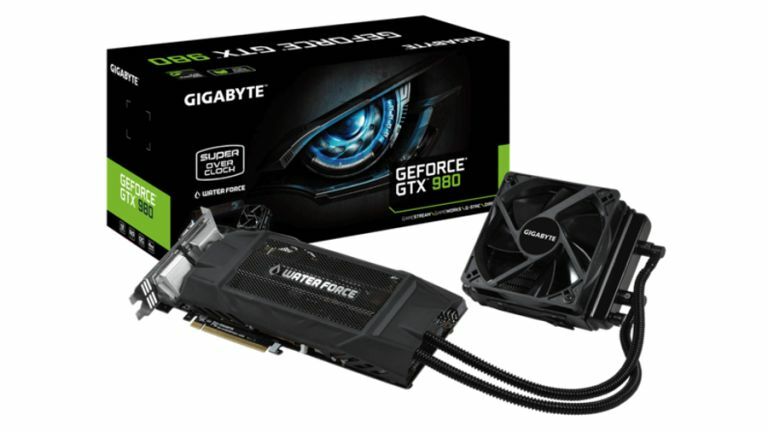 Gigabyte has announced its new GeForce GTX 980 Waterforce graphics card, which benefits from closed-loop water cooling. The GTX 980 comes with a pre-installed water cooling unit and radiator connected via twin SFP tubes, and the cooling system covers not just the GPU, but also the video RAM and MOSFET, meaning there's no need for any additional fans on the card. That means this is a virtually silent graphics card, Gigabyte boasts, and it runs very cool to boot. Indeed the company says that the Watreforce runs up to 38% cooler than the reference cooling solution. Gigabyte also notes that when producing these video boards, it utilises technology known as GPU Gauntlet Sorting to ensure that "only the strongest processors survived". In other words, lesser quality GPUs were cast aside when manufacturing the GTX 980 Waterforce, to make sure these cards offer more overclocking headroom, and more stable overclocking performance in general. As for the specs, the base clock runs at 1228MHz with boost to 1329MHz, and in overclocked mode it's 1253MHz with boost to 1354MHz. 4GB of GDDR5 memory is on board, with ports including Dual-link DVI-I, DVI-D, HDMI and three DisplayPorts. The Gigabyte logo is also LED illuminated, if you appreciate those sort of touches, and the company notes that you'll need at least a 600W PSU to be able to supply sufficient juice for this card. The GeForce GTX 980 Waterforce is out now and you can currently pick it up online for around the £400 mark.